You will then be asked to provide details so that I can process your order. My posting days are usually Tuesdays and Fridays, but I do sometimes make trips to the post office between these days. Please allow 3-5 business days for delivery within the UK, 5-7 business days for Europe and 7-14 business days for the Rest of World. Please note that international delivery is sometimes further delayed by customs. My postage prices do not include tracking in order to keep costs down, but if you require tracking for an additional fee just contact me to arrange this. 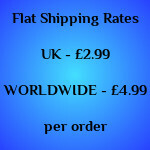 If you are in the UK I can also accept a cheque or postal order or a direct bank to bank transfer. I do not have the facility to accept card payments other than via Paypal. If you are not happy with your purchase, please return it to me within 7 days. I will send a refund to you for the purchase price as long as the goods are returned in their original condition. Please include a note with the item to tell me your name, address and email and also state the reason for the return. I do not refund postage costs unless there is a problem with the item.